While writing an article for a future edition of the soon-to-be-released digital magazine, Digital Genealogist, my computer restarted -- all by itself. Instantly my screen turned black and I silently hoped that I recently pressed Control-S.
After the computer restarted, I opened my document and fortunately I did not lose any of what I had written - thanks to Control-S.
Control-S is a simple keyboard shortcut that many programs, including word processors, utilize to save the current document. If you would rather not have to rethink and retype due to a computer failure, be sure to save your document often. My routine is to type Control-S after every paragraph. My paranoia stems from experience. Control-S is as simple as pressing the space bar and takes about the same amount of time. For me, using this shortcut is worth the extra millisecond of effort. Saving a document in a word processor can usually be done via a couple of other methods too: clicking on the Save icon in the upper left, or clicking on the Save option under the File menu. Windows XP has numerous keyboard shortcuts that will assist in quickly switching between open programs, refreshing an Internet page, or toggling StickyKeys. Visit Microsoft's keyboard shortcut page here. We're excited to be involved in several major conferences in the next month. If you are in the area, please stop by and visit with us. September 29-30 in Pittsburgh. Pennsylvania Genealogy Conference 2006. Millennia will demonstrate Legacy on Saturday at 7:30AM, held at the Sheraton Station Square Hotel. Visit http://www.pagenealogyconference.com/ for more information. Visit http://www.myancestorsfound.com/jamboree/jamboreeCW.htm for more information. Visit http://www.family-roots.ca/ for more information. November 4 in Campbellville, Ontario. 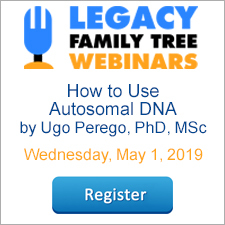 Enjoy an informative day learning how to get the most out of the time that you spend recording and sharing your family history using Legacy Family Tree. This workshp contains a significant segment covering introductory and advanced source recording. Registration is required. Visit http://globalgenealogy.com/workshops/index.htm for more information. Want us to teach Legacy to your society? We often teach Legacy classes to societies. We even teach all-day seminars on genealogy technology. For more information, please send us an email. I have birth info in both the birth event and in an alternate birth event. There is enough info to make the alt. birth data more likely, but I would still like to keep the two. Is there a way to switch the information in the two events without having to retype everything manually and add the sources one by one? A great question Nina, and there is a simple solution. It sounds as if you understand the concepts in both the training video Researching with Legacy: Mastering Events and Chronologies and in the online article entitled How to Record Conflicting Information about recording all the evidence. In the Individual's Information screen, highlight the Alternate Birth event by clicking on it once. Click on the Options button, and click Swap with Birth Information. Performing this function will not only swap the date and place, but it will also swap any attached sources and pictures too. There's one limitation - if you have information in the Description field of the Alternate Birth event, it will not get swapped because the main birth event does not have a similar description field. If you don't use this field then you won't have any problems. Ancestry recently announced a new database which should interest British researchers. British Phone Books 1880-1984 contains British phone books published between 1880, the year after the public telephone service was introduced to the UK, and 1984, from the historic phone book collection held by BT Archives. Currently the database contains 430 phone books covering London and large parts of Essex, Hertfordshire, Kent, Middlesex, and Surrey. Phone books help you pinpoint where your ancestor lived in a certain time. Once we know the when and the where, we can look for other records about them. If you are an Ancestry subscribers, or to learn more information, click here. With Legacy open, click on the Options menu, then click Customize. Click on the View tab. In the Ancestor Color Coding section, turn on the option. In the Family View, navigate to yourself. Click on Tools, then Apply Ancestor Colors. The color coding is now set and visible in the Family View. Check the 4th option of 4 Line Colors. Save. Not only do these color-coded charts look great, but they compliment the color-coded organizational system. Click here to review the other organizational systems we have published. If you did not attend this year's FGS conference in Boston - don't worry! Most of the lectures are now available to download and listen to for less than $2 each. That's quite a bargain when you consider that attendees spent hundreds of dollars, even thousands of dollars on registration fees, parking, food, hotel, airfare, and goodies from the exhibitor's hall. If you still want to attend FGS 2006, you can - virtually! Visit http://stores.lulu.com/fgs2006. If you use Legacy's IGI Searching tool, you may need to update your FamilySearch.org password. Forthcoming changes to the FamilySearch website may stop certain passwords from working. To prevent this from happening to you, please go to www.familysearch.org and manually sign in via the "Sign On" link in the upper right. If you get a message that your password is expiring, you will need to go to your FamilySearch account and change your password. If you sign on without getting a warning, your password is fine. In the main toolbar, click on the Search menu. Then click Search the IGI website. Click on the Options button in the lower right. Click on FamilySearch account settings. Enter your updated password here. Records of 30 million passengers on thousands of ships sailing to destinations worldwide launching soon. 1837online, in association with The National Archives, is proud to present Ancestorsonboard, a new database featuring BT27 Outward Passenger Lists for long-distance voyages leaving the British Isles from 1960 right back to 1890. With Ancestorsonboard, you can search for records of individuals or groups of people leaving for destinations including Australia, Canada, India, New Zealand, South Africa and USA – featuring ports such as Boston, Philadelphia and New York. Passengers include not only immigrants and emigrants, but also businessmen, diplomats and tourists. Images of the passenger lists will be available to download, view, save and print. About 200 Legacy cruisers just returned from our 3rd annual Legacy Genealogy Cruise - a 7-day genealogy vacation to Alaska. Most of us brought back souvenirs, hundreds of digital pictures, new genealogy and Legacy information, and a few extra pounds. We saw killer and humpback whales, bears, glaciers, bald eagles, rain, and mountain goats. We rode trains, flew in float planes, and hiked Alaskan rainforests. In the evenings we experienced Broadway-style shows, comedy acts, magic shows, and midnight buffets. Legacy classes featured ten hours of interactive, personal instruction; 35 door prizes; a 41-page syllabus; and the opportunity to exchange suggestions and feedback personally with the developers of Legacy. Cruisers had such a good time that many already signed up for next year's cruise to Hawaii. Our 4th annual Legacy Genealogy Cruise features a 12 day Hawaii cruise from Vancouver, B.C., Canada - September 19-October 1, 2007. We hope to have several different tracks of genealogy instruction from Legacy instructors and other well-known speakers. We also want to show you spectacular mountains; verdant forests; active volcanoes; and shimmering, thundering waterfalls. We want you to see the unsurpassed beauty of Hawaii in the grandest way possible. Our cruise visits four fascinating Hawaiian islands, with overnights in Honolulu and Maui. Bring lots of film so you can show your friends back home the unbelievable beauty and amazing colors of Hawaii. We're off on our 3rd annual Legacy Cruise. The sales office will still be open with its regular hours (1-800-753-3453 or Sales@LegacyFamilyTree.com). If you didn't receive the Legacy installation password, it is "family" without the quotes. If you have how-to questions, the built-in help system is a great resource. Look for the context sensitive help buttons on many screens. The Legacy user group mailing list is an excellent place for help. 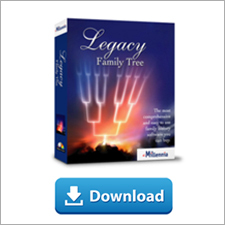 You can sign up at http://www.LegacyFamilyTree.com/LegacyLists.asp. It also has some great information on using the various features in Legacy.